What is the purpose of the reduction-drive gearbox? Home>FAQ>What is the purpose of the reduction-drive gearbox? Depending from the filling level of a gas tank the efficiency might vary very much. Two gears installed in «Antonio Merloni Cylinders Ghergo Group S.p.А.», cisterns eliminate this disadvantage. 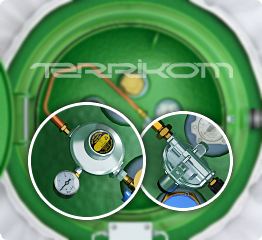 Double reduction allows to be independent from the quantity of gas in the gas tanks – pressure will be the same in full and in almost empty cistern. In summer heat and in winter frosts the pressure will be stable till the cistern will be completely discharged. Independence from the main gas pipeline. Self-support. Efficiency of independent gas. Benchmarking study of different energy sources.